The above is taken from the recent teen film, Easy A. 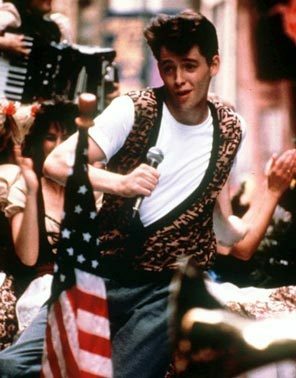 This is just one of several films who have made reference to the late, great John Hughes. In recent years, many films (and some television shows) have paid tribute to the writer, director and producer; either referencing his work or echoing the themes and characters portrayed. It could be argued that the teen/high school films of today would not be the way that they are if it was not for the films from John Hughes, for example, the popular ‘nerd’ character, seen in films such as Superbad, are clear reflections of the Anthony Michael Hall characters from the Hughes films. Since his untimely death in 2009, Hughes’s work has been used as a theme for a recent episode of One Tree Hill, dedicating the episode to the director. The episode saw the characters face various situations that featured in Sixteen Candles, Home Alone and Pretty in Pink. Molly Ringwald & Michael Schoeffling as Sam Baker & Jake Ryan in Sixteen Candles and Bethany Joy Galeotti & James Lafferty as Haley James Scott & Nathan Scott in One Tree Hill. His films are were a huge success in the mid 1980s and still remain popular today. His films were so relatable to teenagers, creating likeable, true characters and creating storylines that echo the thoughts and feelings of teenagers. After all, it’s every girl’s nightmare to have her parents forget her 16th birthday! The Breakfast Club is a particular stand out amongst the John Hughes collection. Telling the story of five students in detention, who have nothing in common and who simply see each other as the stereotypes in which they have been labelled; “The Criminal”, “The Princess”, “The Athlete”, “The Brain” and “The Basket Case”. The group were assigned an essay by the school’s principle detailing “who you think you are”. Forced to spend time together, they end up discussing their deepest secrets; realising that they all have poor relationships with their parents and how they worry that, having become friends, after the detention they will all continue to ignore each other and return to their own individual cliques. Molly Ringwald, Anthony Michael Hall, Emilio Estevez, Ally Sheedy & Judd Nelson as Claire Standish, Brian Johnson, Andrew Clark, Allison Reynolds & John Bender in The Breakfast Club. Also known as the “Brat Pack”, the cast of the popular 1980s films, including many of Hughes’ films; Molly Ringwald, Anthony Michael Hall, Emilio Estevez, Ally Sheedy, Demi Moore, Andrew McCarthy, Rob Lowe and Judd Nelson became household names during the decade. However, not all went on to outstanding Hollywood careers, but will be remembered for bringing to life some of the most inspiring and true characters featured in movies aimed at teenagers. John Hughes died on Auguest 6 2009, following a heart attack whilst he was out walking and was the subject of a tribute at the 2010 Academy Awards where the stars of several of his films came together to celebrate his work. I think John Hughes’s work will remain hugely successful and popular with his characters and plotlines continuing to inspire and influence future high school films. Hopefully generations to come will still enjoy the classic 80s teen movies and recognise the influence John Hughes has had upon teen films and popular culture since their release. Subscrive to my blog & receive email notifications of new blog entries.